There is an art and a bit of luck to acquiring tools from garage sales, second-hand shops and e-Bay. If that does not work for you and you are opposed to buying cheap knock-offs from Harbor Freight, give Harry J. Epstein Company a try. They handle closeouts and blemished units from many companies and emphasize American Made whenever possible. If all that fails, then it is often hard to beat Amazon especially for their product reviews. Often part of being frugal is simply learning what you can about a product before you buy it. Of course it can be helpful to filter your Amazon tool search by ‘blem’ for blemished, or factory second tools or factory refurbished tools. 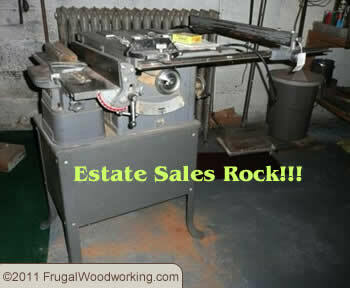 Estate sales can be an affordable way to find used woodworking tools in your area. They are especially helpful if you are looking for older wood working tools. One site that I find helpful is EstateSales.net. You can have the site notify you of new sales in your area, or you can search for specific items. It would be more useful if the search or the regions had RSS feeds which are lacking at the moment. You never know what you'll find at an estate sale. I buy a lot of my power tools as reconditioned. My experience has been positive. In the case of reconditioned tools you are dealing with a tool that has been looked at and evaluated by a human at the company, which is more than can be said for the new tools which are packed by a robot. The reconditioned tools usually carry the same warranty as the new tools so they are a safe investment of your woodworking dollars. Amazon has great prices on reconditioned tools and in many cases they qualify for free shipping. Bosch, Milwaukee, Ryobi and many others sell their reconditioned, CPO tools directly on Amazon. Take a look at Amazon’s Reconditioned Tools. You can save a lot of money and get some great performing tools. I ran across this shared on a forum. It cracked me up and taught me a lot at the same time. This collection of tips for dealing with your significant other and sellers at a flea market when buying old tools contains a lot of wisdom. It also is pretty tongue-in-cheek funny. When looking for tools, your local Craigslist.org can be a good source. You don’t have as much of the risk as you might with eBay because you can see the tool before your purchase it, and you don’t have to pay for shipping either. However, if you are in the market for a chisel, you might have to check craigslist for a week or more before a chisel appears in the tool section. Thankfully, you don’t have to keep checking back day after day to look for one. You can use an RSS reader to check the RSS feed for that site and when something matches that search shows up, it will show up in your RSS reader. Type into the search box what you are looking for. No Chisels available for sale today, but what about in an hour from now, or tomorrow, or next week? In this case, there was nothing that matches my search right now. However, I don’t want to have to come back every day to do the search. If I click the “RSS” button in the lower right corner, I will get the RSS feed for this search. Now I can have my RSS reader, check that feed for me. If you use the Google Toolbar, Google will automatically ask you if you want to add teh rss feed to your reader, or to your iGoogle homepage. Add it to whichever one you use, then when the “chisel” for under $20 shows up on craigslist, it will show up in your reader. You’ll be able to click on the listing and stand a good shot at getting to it first. Here is what my iGoogle page looks like when a "plane" appears for my plane search on Craigslist. TIP: A search can be narrowed by price, so if you are looking for a table saw but don’t want to spend over $400, you can set a $400 maximum. That minimum will carry into your RSS feed too, so you won’t be notified when somebody posts a $500 Bosch or a $3000 Sawstop. TIP: Every category on Craigslist has its own RSS feed. So if you are not looking for a specific tool, but like to keep an eye on what’s available, just go to the tools category and scroll to the bottom of the page and you will find an RSS link there too. Add it to your reader and you can see what appears continuously.